Pictured clockwise are Erin (Lach) Hertz, Jen (Zahn) and Mike Arlien, Andrea (Limke) Hedberg and Liz (Ellis) Slotsve. 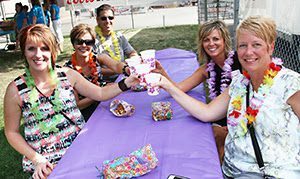 Minot, N.D. (July 20, 2016) — Minot State University invites alumni and friends to a luau party at the North Dakota State Fair from 5 to 8 p.m. July 27 at the fair grounds. The event will be in the outdoor area of the Flickertail Gardens, and admission is free. The MSU luau provides the venue for Minot State supporters to rekindle old friendships and create new memories. Fargo’s Boomtown, a country-rock band, will begin playing at 6 p.m. There will also be drink specials and prizes.